January's Book-of-the-Month, by Dianna Hutts Aston and illustrated by Julie Maren ! An Orange In January reminds us that biting into a plump, juicy orange is one of the great pleasures of winter. But it goes on to ask, how has that snack found its way to you? 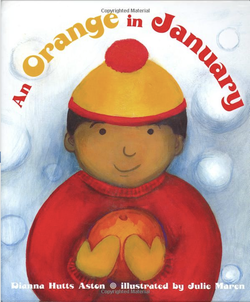 This book tells the tale of an orange's life journey - from spring blossom to bright, round fruit, from tree to truck to grocery store. And perhaps then into the hands of a chld, who takes it from its shelf in the produce section, saves it for school the next day, and then shares it with friends at recess. Use this link to find other children's books for you to read to your children. Choose the charity you want to read for and then select the books you want to read. For each book you read online, the Pearson Foundation will donate a book to a leading literacy group on your behalf. The more you read, the more books they give.